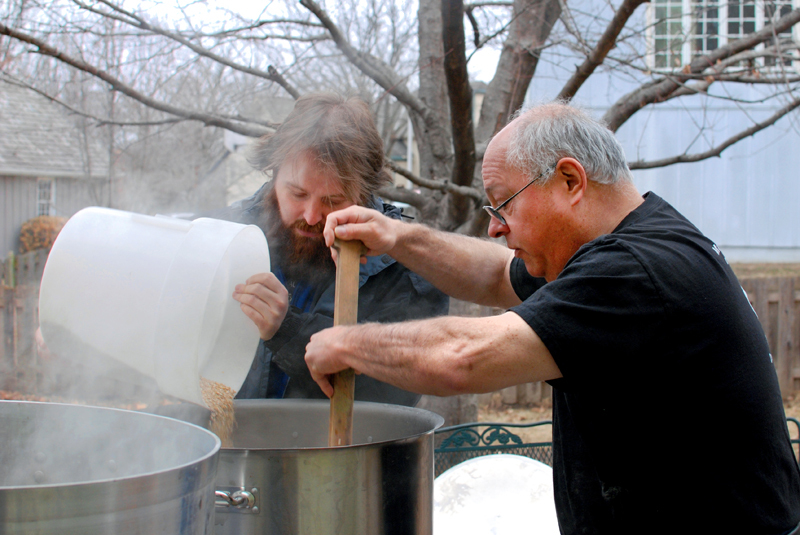 Michael Crane (right) seldom drank beer before he started homebrewing. Photo by Stan Hieronymus. At first it might seem like a joke, or a headline you’d find in a satire-based magazine. However, spend enough time in certain homebrewing circles and the name Michael Crane comes up. He’s the gold-medal-winning homebrewer who seldom drank beer, or any alcoholic beverages for that matter, before he began making beer at home. Perhaps it’s cognitive dissonance. Most homebrewers get started in the hobby because they plan to drink what they make. Not Crane, the Kansas resident who some consider a brewing savant, able to create memorable beers even though he doesn’t know what they should taste like. For instance, last October he won best of show at the Hoppy Halloween competition in Fargo, ND, for his Thanksgiving Saison, dosed with raspberries and Brettanomyces. Beet beers are another matter. He brewed his first after a less-than-serious suggestion from one of his sons, Joey. He simply rinsed off the beats, sliced them, boiled them and added them to a batch of cream ale. They make a strikingly bright pink beer. One judge wrote that it should be served on the Starship Enterprise, and another that if he could have, he would have given the beer 10 points for appearance (three is the most allowed). Of course, he also described the beer as undrinkable. “Many people said it tasted like dirt. Well, it was dirt,” Crane said. “I did not know you are supposed to peel beets.” Now he does, and makes Beet Beer Classic, Beet Light, a Berliner Weisse with beets he calls Magenta, and a Beet Mead. One Saturday in February his beet concoctions won four medals in homebrew competitions in three states. “And I hate beets,” he said. Crane’s father drank locally made spirits when his son was growing up in Tennessee in the 1950s and ’60s, and the family shared Mogen David wine on religious holidays. When Crane started at the Kansas City Art Institute in 1975, it seemed to him all his classmates drank. He didn’t. Beyond a few social nips, alcoholic drinks simply were not part of his life, certainly not beer. Nonetheless, it made perfect sense to Crane to buy a Mr. Beer Home Microbrewery Kit when his wife, June, spotted one on sale at Target. Both his sons liked beer, and he could make it with them. “OK, this will be different,” Joey thought when he returned home from graduate school on winter break at the end of 2010. Unlike his father, he is beer-experienced, planning in advance the ones he would drink when he turned 21, posting his tasting notes on line, and showing a willingness to spend amounts of money for beer that startled his father. He was happy to brew three basic beers with his father over the break. Stan Hieronymus, a contributor to All About Beer Magazine for 20 years, is the author of several books on beer and brewing. The most recent, For the Love of Hops (Brewers Publications), deals with all aspects of one of beer’s essential ingredients. Beautiful story featuring some of my most favorite people! Viva La Brasserie Crane! This article captures the essential and elusive aspect of Michael Crane’s spirit. Thanks! And June is right along-side, working her magic. Thanks folks!!! OOPS! Misspelled my own name-oh well. So June, I would really love a copy of this article. I can’t get one to print.